DCL's well staffed design and engineering team works closely with the company's R&D personnel to bring concepts to commercial reality. A number of innovative designs for catalyst substrates, housings and silencers have been commercialized and patented. 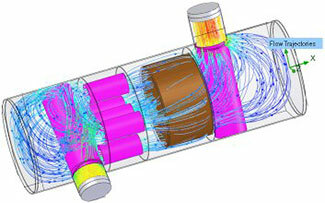 The engineering group utilizes the latest design techniques, including solid modelling design, computation fluid dynamics (CFD), finite element analysis (FEA), catalyst modelling software, acoustic analysis software and Advanced Product Quality (APQP) planning.